​Canvas has been used for a long time for different purposes. The strength and durability of the material make it suitable for various functions. One of the most common uses of the canvas is painting. It has been used for centuries by famous artists to do their paintwork which is still in good condition in museums across the world. It has found an even more interesting function as photographic images are now transferred or printed on canvas. It is also suitable for simple mounting of photographs. You may wonder why someone would use canvas for photography work while the traditional paper seems to work just fine. Canvas does not look to the eye like it would present as well as paper when it comes to photography. However, canvas actually shares some qualities with paper when it comes to photography and has certain unique qualities that give it an advantage over paper as a printing material for photos. Here are some reasons to use canvas for your photos. Canvas is generally a longer lasting material and would keep the photo for generations to come. It is more resistant to humidity and as such photos can be mounted in areas that are humid such as decor in a sauna and kitchen among others. It does not need a frame and looks very complete even without one. The photograph on canvas has got a unique look that can only be achieved when a photo is put on canvas as opposed to paper. The general design may not be suitable to mount in certain settings. Get your canvas and nail it to the frame; the frame should be slightly smaller to allow the canvas to wrap around the edges. Spread the medium gel across the canvas evenly though not to the sides. Place the photo on the canvas making sure it is well centered. It should be slightly bigger in size than the canvas. Note that the photo should be mirrored when printing so that it appears the right side up when transferred onto the canvas. Gently but firmly press the photo to the canvas evenly. Turn the canvas upside down and use the hard card (an old credit card or something similar would do) to repeat the pressing but this time on the underside and ensure you straighten all creases and remove air bubbles. Let the medium dry for at least 24 hours. During this time the project should not be disturbed at all. After the drying period get the pair of scissors and cut the hanging edges of the photo as close as possible to the frame. Use your file to even the edges of the cut photo until it is at the same level as the canvas. Spray a coat of clear varnish to give it a gloss and to protect the photo. After the drying period, turn the project upside down and apply the medium gel to the sides of the frame. Fold the photo over the sides of the canvas and use tacking pins to hold it at the back of the frame. Press the photo onto the sides of the canvas where you have applied fresh medium gel and smooth out all creases again in a similar fashion to the first process and let it sit for a similar period of time. After the whole project is dry, start the spraying process. This additional feature takes twice as long to achieve but gives a unique look. You can also add an effect by applying medium gel over the complete product and using a cloth to dub lightly over. This does not involve transferring the image onto the canvas but simply pinning it to a canvas that has been spread across a frame. Place your photo evenly on the canvas and fold it over the edges using tacking pins. You could choose to spray a layer of clear varnish to give it a gloss. This is an inexpensive technique that requires cheap nail polish remover to do the job. Place the photo on the canvas and secure it using the masking tape. Soak the cotton cloth in nail polish remover; do not soak it too much. It should be well soaked but not dripping. Press the soaked rug over the image. Progressively do this until you cover the whole surface. Let the nail polish remover dry and repeat the process until the image is transferred onto the canvas. This method can also be used to transfer images onto other surfaces such as wood and tiles. The general method works but does not give similar clarity and quality with colored photos. Lay down the canvas and place a tissue paper on top of it. Trim it to the exact size as the canvas. Put your iron on high heat setting and iron the tissue paper or serviette removing all creases. Use the tissue as your printing paper; put it into the laser printer and print the image to be transferred. Place your image on the canvas and use a foam brush to gently remove any creases and air bubbles; you have to be extra careful because of the fragile qualities of tissue paper. You can add a protective layer of medium gel or clear varnish. You can choose to either have the photo at the exact size of the front side of the canvas; in this case, you will need to neatly cut and file the edges of the photo. You may also choose to wrap it around the frame in which case you will need to apply the medium gel to the sides of the frame and press the image onto it just like you did in the first phase. 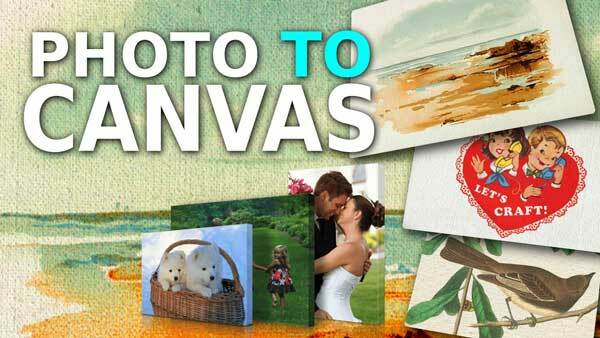 Transferring photos onto canvas is an easy and very entertaining art technique. It is relatively very cheap and can be easily taught through online tutorials. The product is unique and refreshing. It can also be used in just about any setting. Try it out today. You will enjoy it.